Isle Box is a subscription service delivering outdoor gear in either monthly or seasonal shipments. The Cost: $44.99 monthly, ships for free, and there are discounted options for 3 or 6-month subscriptions. Seasonal boxes are $125 with free shipping. Every month they include an info card detailing the theme, items included and their values. This month’s theme is “Gourmet Country”. This month’s Isle Box started with this really impressive kitchen kit! MSR is one of my go-to brands for camping gear. I own one of their tents, an emergency rain fly, a stove, and I use their stakes for guy wiring everything when camping, so I was extra stoked to see a high-value item from them when opening my box this month! This kit is compact but really packs a ton of gear. 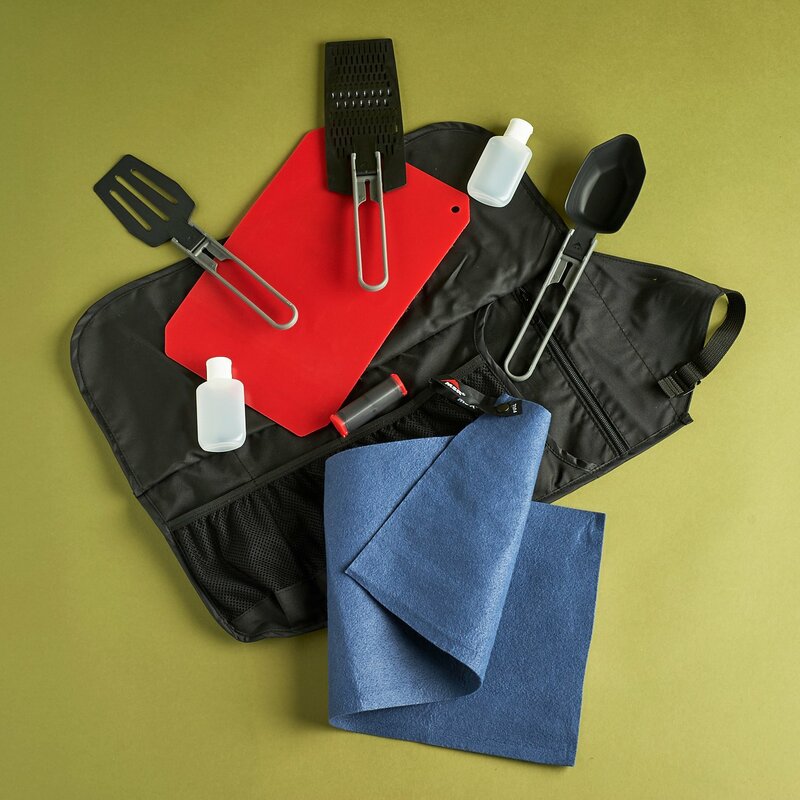 You’ll get 2 squeeze tubes (perfect for condiments), a seasoning shaker, a quick dry PackTowl towel, a cutting board, and a set of MSRs folding spoon, spatula and grater/strainer! All of these conveniently fold into the rollable pouch, which features a few extra sleeves and zippered pocket. You could omit a few items you don’t plan on using and use the pouch to store other camp kitchen gadgets too, as the strap that holds everything together is adjustable. The folding tools are all super lightweight, and the folding technology is really intuitive – just squeeze the handle and it will unlock so you can fold it in half. The spoon also doubles as a cup measure, which is super handy when you’re making cook-in-pouch meals. I love the addition of the cutting board too. It’s a little hard to bend flat after being rolled into the pouch, but you can get it to lay flat eventually, and it certainly beats a rock or dirty picnic table. While I don’t know if I’d sacrifice pack space for this on a long backpacking trip, I will definitely be toting this on future car camping excursions! This is a really nice addition to the MSR pouch as it’s just about the same size and can easily be rolled up into the kit. The knife is really light, the handle is really grippy, the blade is super sharp, and the included sleeve snaps into place when the knife is inserted. The sleeve also features a snap lock system that folds over, so you can attach it to your clothes or a belt, whichever suits your needs. Hultafors is well known for making amazing knives, and this feels like a no-brainer addition to any camp kitchen. This PackTowl is a lighter, thinner material than the one included in the MSR kit, and would be perfect to have on hand while cooking at camp. It’s the size of a standard kitchen towel, packs down nice and small, and the pouch itself is attached to the towel so you won’t lose it. It’s a nice economical alternative to toting around a bunch of paper towels, and since it’s quick dry you can rinse it up, wring it out, and be on your way pretty quickly. They also threw in a vinyl Isle Box sticker this month. Verdict: I haven’t reviewed Isle Box in a few months, and this was a great first box back! As I’ve said before, I think this box is great for campers and backpackers looking to expand their gear selection and discover new products. We’ve got about $64 worth of gear here (or about $54 if you go with the Amazon price for the MSR kit) which definitely exceeds the $45 cost. I know I’ll get use out of everything in here, and it was very smartly curated to revolve around the camp kitchen theme. This box is far better than the March Isle box I received (maybe I got the February one instead?). Mine was $55 RV for a $45 box–not a great deal, IMO. Any one of these items would have been better than what I got! Maybe they send different months to different people? I also got a completely different March box, with a Klymit travel pillow, a Hydrapack water bottle, Epic wipes, and granola bar. I agree that the kitchen one is much better. I would have loved some cooking gear! I got a weird flat cosmetic bag, the wipes, camp soap, and a granola bar. Would have loved the pillow! I’m surprised that they didn’t include an apparel item after doing their big blitz to add customer sizes to all the user accounts. I was expecting at least a pair of hiking socks or something.